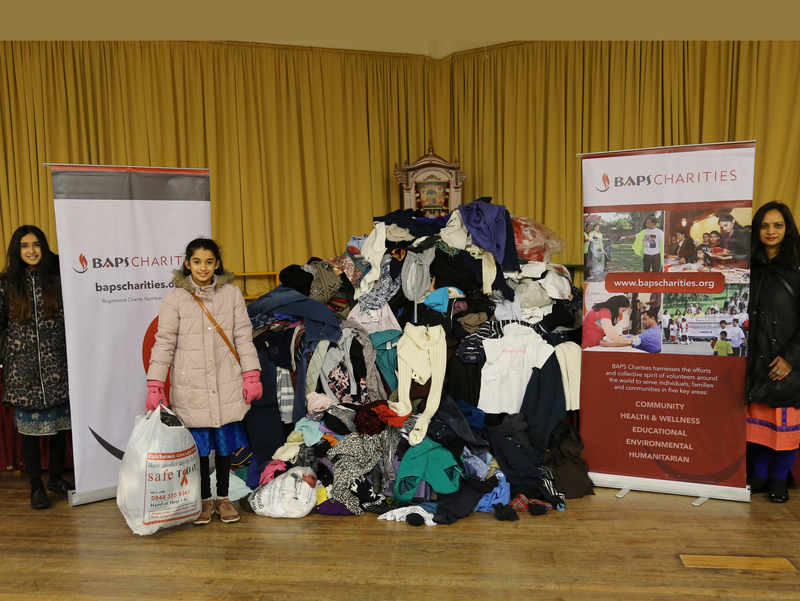 Volunteers from BAPS Shri Swaminarayan Mandir, London joined BAPS Charities in December 2017 to collect clothes for the homeless. The collection was part of the Mandir’s proactive and ongoing commitment to support and serve the needy. As part of this initiative, volunteers also collected food for the homeless. Details of this can be found by clicking here. Homelessness is devastating, dangerous and isolating. On average, homeless people die at just 47 years old. People sleeping on the street are almost 17 times more likely to have been victims of violence, and homeless people are over nine times more likely to take their own life than the general population. A variety of warm pieces of clothing, including jumpers, coats, hats and scarves were deposited at The Swaminarayan School opposite the Mandir and various other collection points during the first two weeks of December. Worshippers engaged with owners of local businesses to collect clothes at their respective shops and offices. The collection was particularly timely due to the spell of very cold weather across London and the UK during the early part of the month. Following the collection, more than 150 large bags of clothing were distributed to Crisis, the ‘national charity for single homeless people’, The Passage, the charity that ‘helps homeless people transform their lives’, and Glass Door, the charity that believes ‘no one should have to sleep on the streets of London’. To learn more about Crisis, The Passage and Glass Door, please click on the respective links.